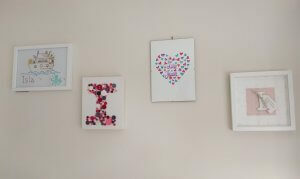 Over the last couple of years we have slowly added various different pieces of art work to Isla’s bedroom. A personalised Noah’s Ark, an ‘I’ made out of buttons that I threw together one afternoon a while ago, a picture from Isla’s Uncle and Aunty that has her date and time of birth, and weight on… and then just a picture of some butterflies, that just doesn’t seem to fit as it is nothing really related to Isla, and is not personalised at all. I’ve been looking for something to replace it for a while, but hadn’t yet found the right thing. When I was given the opportunity to review a piece of HannahRobertsArt I couldn’t wait. 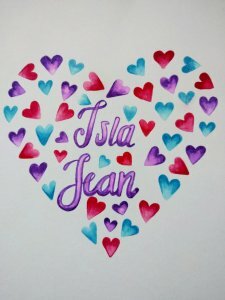 Hannah makes some beautiful personalised art work (as well as some pretty awesome Harry Potter art work! ), and one day, once our family is complete I would love one of her Family Raincoat paintings. 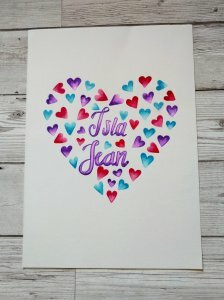 We chose the personalised heart for Isla’s room. It is painted using watercolours, and is made to order. 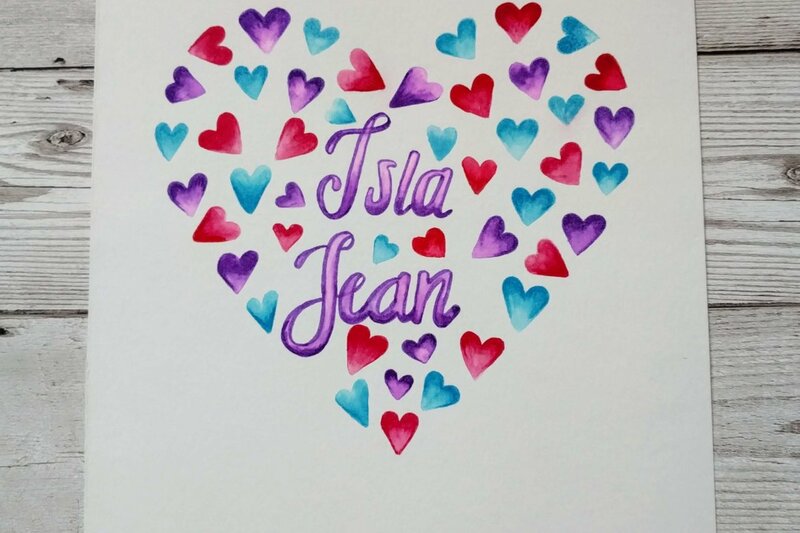 As this piece of art work was for Isla’s room we chose to have just her name on it, Isla Jean. But I think it would be perfect as a family piece with every family member’s name incorporated, and also perfect as a wedding gift with the happy couple’s name included. This piece is available for just £14, which is a fabulous price for something so beautiful and personal. I think it would be fantastic is there was the option of ordering it with a frame included though, as currently it only comes on the A4 card, but that is why Hannah is able to offer it at such a good price. The colours are really bright, but not garish. I love the fact that the hearts aren’t just block colours but fade out, it gives the picture more depth. I think it is a perfect fit for Isla’s bedroom. I love your seeing how your children are flourishing! I can relate to them as I am a mammy too! I enjoy reading because you seem to have a normal lovely family. Your blog is interesting because it is a little bit of everything. The reviews are fun and fab!